If you are looking for something that you don't see here…call us! Why pay for what you already own? Most stores selling propane require you to trade-in your tank – even if it's not empty – offering you no credit for your remaining propane. Not us! We believe you should pay only for what you need. 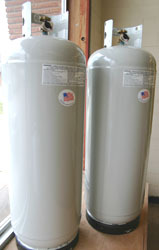 This means that if you bring in a tank that is half full, you only pay for half of a tank of propane! Need a new tank? No problem! 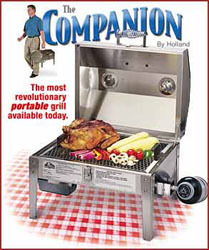 We are proud to carry the full line of Holland Grills and Accessories. Their exclusive patented system places the drip pan between the food and the flame so food can't catch on fire! And Holland Grills are MADE IN THE U.S.A.!! The ultimate portable grill – perfect for tailgating, camping and picnics. Cast iron burner with lifetime warranty. Need accessories for your grill? We've got them! Seasonings, sauces, flavor chips, rib racks, covers, half grids, tools, thermometers/timers, side burners, mounting kits and more! If you have a gas fireplace, you need gas logs! We carry a full selection of styles and sizes to meet your needs including Real-Fyre logs, manufactured to the highest standards with high definition bark and natural colors for authentic wood realism. Need a grate for your logs? We've got those too! 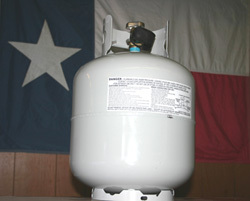 If you own or rent a recreational vehicle, trailer or camper, you need propane! Don't forget to fill-up your tanks before you leave town. We offer fast, friendly, affordable service to get you on the road and enjoying the great outdoors! Also – ask us about our RV accessories. We can help you run multiple appliances with ease! We've got you covered – from masks and protective gear to acetylene and oxygen tanks. Come by to see our complete collection. 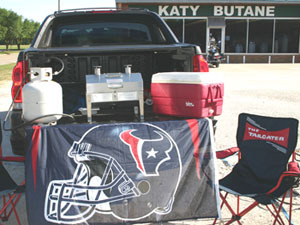 * Welding Supplies only offered at the Katy Propane (dba Katy Butane) store. Are you ready for more than just a grill? How about an outdoor kitchen?? A hot new trend – we can help get you all set up. Relax and enjoy your backyard with an outdoor fire pit. Many designs, finishes and styles available. Your neighbors will be jealous! Sometimes the weather gets down right cold – even in Texas! The Mr. Heater series of travel heaters connect directly to a portable propane tank so you can take comfort with you when camping, hunting or working outdoors. Need something for your home? Try a Vanguard vent-free gas heater – available in blue flame or infrared varieties.